Adjustable Bag Gripper survives harsh environments. Able to handle bag weights to 110 lb and sizes from 12 x 12 x 3 in. to 35 x 21x 6 in., bag gripper eliminates need for custom tooling and can be adjusted in minutes for different production runs using hand wheel. Its 5/8 in. dia stainless steel fingers lend to strength and withstand harsh manufacturing environments, while decker mechanism facilitates accurate bag drop once positioned over pallet. In less than 30 sec, tool's bag width can be changed from 12-21 in. XENIA, OHIO - SAS Automation recently introduced a new adjustable bag gripper for a variety of bag handling applications that eliminates the need for costly custom tooling and can be adjusted quickly and easily in minutes for different production runs using a simple hand wheel. Ideal for plastic, woven cloth and paper bags containing heavy products including grains, chemicals, dog food, minerals and plastic resins. This innovative gripper uses stainless steel fingers for both strength and their ability to withstand harsh manufacturing environments. A decker mechanism is designed into the tool to facilitate an accurate bag drop once positioned over the pallet --crucial for a tightly packed pallet. In less than 30 seconds, the tool's bag width can be changed from 12 to 21 inches. Bearings are double-sealed for long life. Can be fitted with a servo drive to automatically adjust width while on-the-move to accommodate mixed loads. Uses 5/8" diameter solid stainless steel radius fingers for long-lasting durability. High flow pneumatic valves provide a complete open/close cycle in less than 600 milliseconds (.6 seconds). SAS is a leading supplier of modular EOAT components, end effectors & robotic gripper systems - capable of servicing any part and any robot. SAS manufactures in the USA "get a grip! ", and distributes "nip it!" Nile sprue nipper line, and "GRIP IT!" Asian chucking/gripper line. SAS is ISO 9001:2000 Quality Certified. Specialists in Robotic End-of-Arm tooling & Gripper systems, Sprue Nippers, CNC degating & Insert Mold tooling for manufacturing, packaging & plastics industries. Sales, service & support to: USA, Canada, Mexico, Europe. Pressing Tool Jaws crimp PEX tubing. Self-Propelled Mobile Manipulator improves safety, efficacy. Three-Finger Gripper provides over 225 mm of radial stroke. 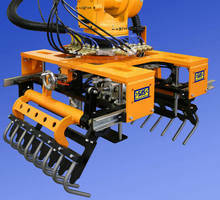 Micro Grippers suit automation applications.